We’d all love to be King for a day and while in the LARP and re-enactment worlds that’s technically possible, it takes time, money and dedication before you’re likely to get that call. Meanwhile, for the rest of us mere mortals, just what do you wear to the ball/battle? There are plenty of guides for the ladies and indeed a LARP Fashion/Black Raven Armoury LARP essentials for ladies is next on my agenda. There doesn’t seem to be much about for us blokes though… it’s not really surprising, ladies are so much better at organising this sort of thing than we are, but it’s about time that changed. The key to enjoying LARP-ing is comfort. Sure, there are moments when that ‘to die for’ piece or outfit needs an airing, but for the most part, you want to be comfortable and that means dressing to suit the climate as much as the event. Remember, if you are going to throw yourself into the character, you’re not looking for a costume… you’re looking for a wardrobe like you have at home. The most important thing to consider for your weekend away is footwear. You’ll want something comfortable, that will go with multiple outfits and even if they’re not straight from the British Museum, you don’t want them to give the game away. If you’re going to throw yourself in, or are a larper already then you’ll be doing a lot of running around and that is always done best in shoes that fit. LARP Fashion have a number of options but there are others. If you can’t find anything that works, an alternative is to make your own boot covers/sabatons. The benefit of wearing boot covers is that you can wear whatever shoes you like and choose comfort 100% over accuracy or attention to detail. Covers can be made from leather, fur or whatever takes your fancy. The other important thing to remember when it comes to choosing LARP shoes is safety. Bespoke designer medieval turn shoes may look amazing, but if you’re going to end up in A&E after slipping on flagstones, maybe it’s best to just cover your trainers in Faux Fur and be done with it. What you wear is very much dependant on what the climate’s like. In summer, linen and cotton is king, whereas in the autumn and winter, wool or felted wool is preferable. For the anoraks amongst us, it’s worth pointing out that cotton wasn’t really on the radar in Northern Europe until much later than you’d find it around the Persian states. But if you prefer being comfy to being ‘accurate’ then it’s definitely the way to go. A good wool or cotton tunic is the male larper equivalent of a little black dress. What I mean by that, is it’s perfect for almost any occasion and with the right accessories, it can be equally at home on the deck of a pirate ship, in the Halls of Valhalla, or your daughter’s wedding. Colour is important, so choose something hand dyed and if possible fairly neutral. Woad blue, grey or plum was pretty common in most villages across Northern Europe for centuries and would be a good place to start. White is also an option if you don’t mind if getting covered in mud, which is inevitable. If you do opt for white, try and avoid the saccharine bleached whites that look like they came from an Arial Ad. There’s nothing like looking too clean to ruin a perfectly good larp outfit. Here’s where you can really make your outfit shine. A good set of accessories can turn a few garments into a wardrobe of opportunities. Whatever kit or garb you decide on, it’s worth investing a bit of time and money in your accessories. 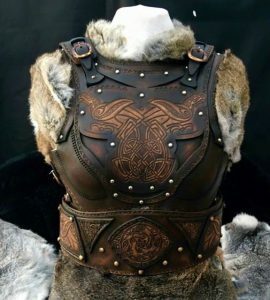 You may not be able to afford or be ready to invest in a full set of armour, but you can accomplish a lot with a decent bandoleer, a bag or even just a good belt. Bear in mind, working with leather is a skill and good leather won’t necessarily be cheap, but remember you can wear your accessories with almost every outfit and that alone makes them worth investing in. If there’s one place to avoid skimping on, it’s accessories. If you do want to make more of an impact then Black Raven Armoury has a series of excellent DIY kits if you don’t mind putting in a bit of effort. A solid wool cloak can not only be a stunning additional to any larp outfit, it can also double as a duvet or blanket or a makeshift roof for a bivouac to keep you warm on chilly nights. A cowl or hood is a simpler less expensive option and while it won’t keep you warm at night, it will keep out the rain and can be worn up or down for different looks. So there you have it, a very simple guide to dressing for your next LARP/Renn Faire or Pirate ball. For the sake of clarity and because frankly, Reddit does not need more controversy, the LARPs we’re referring to, are those of a fantasy/medieval style event. Although to be fair, this simple guide would work no matter what system or theme the event you’re attending has.